More seniors than ever are now struggling with diabetes, and if you are looking to help provide quality care for a loved one with this disease, it is important that you help them eat the right type of diet. Proper diet is one of the best ways for seniors to manage their diabetes and to prevent additional health complications. If you are looking for a few easy ways to help your loved one change their diet for the better, here are a few things to include and avoid in your loved one’s diet. Before you start adding new things into your loved one’s diet, it is important to know what you should be removing or limiting first. Starting by cutting out the bad things, is always a smart approach and can make transitioning to a new way of eating easier. Remember, these are suggestions and should be taken in stride. You don’t have to 100% eliminate every one of these things from your loved one’s diet. Portion control and management are key, you don’t have to completely remove every morsel of sugar from their home. 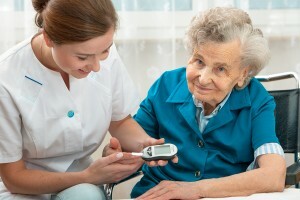 Seniors with diabetes shouldn’t have more than 200 mg of cholesterol per day. Trans fat and unhealthy fat. Seniors with diabetes should have no more than 2000 mg of salt per day. Be careful with packaged foods, drinks and processed items as they can contain hidden amounts of sugar. Unhealthy carbohydrates. Carbs from white bread and white rice and sugar should be removed from the diet. In addition to removing certain things from the diet, seniors should also make sure they are adding the right nutritious elements to their diet. Here are just a few smart additions to your loved one’s diet. Fruit and vegetables. The more colorful the fruits and vegetables, the better. Dark green, bright orange and rich purple fruits and vegetables are best. Lean proteins. Any diabetes-diet should be filled with lean proteins like salmon, white fish, chicken breast and lean cuts of beef. Fiber-filled foods. The more fiber the better for those with diabetes. Beans, nuts, veggies and oatmeal are all great sources of fiber for those with diabetes. Healthy fats. Processed fats, such as fat from sugar are bad, but healthy fats are great for those with diabetes. Good fats can come from sources like nuts and avocados. Whole grains. Healthy whole grains are a good source of carbohydrates. This includes whole-grain bread, beans, lentils and fruits and veggies. Low-fat yogurt and dairy are also good sources. Keep these tips in mind as you start to help your senior loved one with their diet. The right diet can make all of the difference for seniors with this disease so they can live the healthiest, happiest life possible.